Death metal has come to be defined by its tropes, perhaps too much. 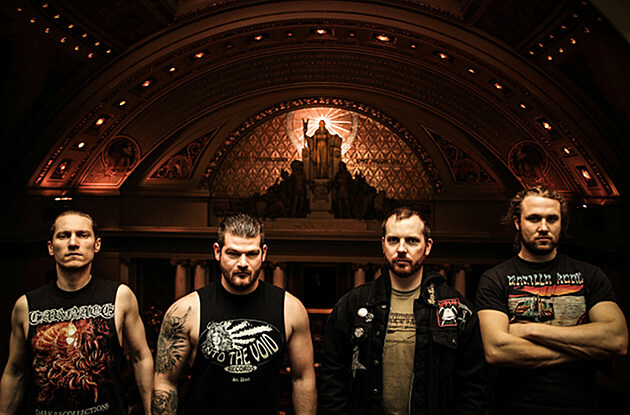 Bands like Minneapolis’s House of Atreus are here to fix that. I first heard the band via one of Ian’s Upcoming Metal Release columns on this very site, where he highlighted the band’s debut EP, Into the Brazen Bull; now things have come full circle and we’re streaming their outstanding first full-length, The Spear and the Ichor that Follows today. I’ve seen people call House of Atreus war metal. I wouldn’t go that far—there’s far too much structure to resemble that family’s normally stormy morass—but if it is war metal then it is ancient war. The Spear and the Ichor that Follows embodies the moment of cavalry cresting over top a hill and then charging into the fray, from the riffs to the Greek mythology-obsessed lyrics. The LP hems closely to the formula that made the first EP stand out so among its peers. Foremost, House of Atreus love their triplet gallops, usually played on the upbeat, pushing the listener forward through the song. On top of those, melodic guitar leads, vaguely reminiscent of prime ’80s teutonic thrash play counterpoint to vocalist/bassist Daniel “Anxietous Nero” Huddelston, whose growls sound like they could shake bowls of gelatin from a distance, but remain intelligible. Absent, or near-absent, are blast beats and tremolo picking—anything that might detract from the gallop takes a backseat. In fact if there’s any weakness to the material, it’s that there’s seldom any time to enjoy the slower or more melodic tracks like “Oresteia – The Unforgotten Scorns.” All of that is more than redeemed by the flow from song to song here. The Spear and the Ichor that Follows is out on May 5th on Dark Descent. Follow House of Atreus on Facebook.